The botanical park is situated between an elevation range of 2,100 metres (6,900 ft) and 3,750 metres (12,300 ft). The park forms the heart of the "tri-junction" of the hill ranges of Sinchula, Helela and Dochula. There is a botanical garden of rhododendrons with in it. The park has a lake known as Baritsho Lake which has religious sanctity as the local people give votive offerings. There are trekking routes or trails such as the Rhododendron walk (1 km), Serchu Nature Trail (1 kilometre (0.62 mi)), Dochula Nature Trail (1.5 kilometres (0.93 mi)); Lumitsawa Ancient Trail (4.7 kilometres (2.9 mi)), Lungchu Tshey Pilgrimage (3.5 kilometres (2.2 mi)), and the Thadna Jungle Walk (125 kilometres (78 mi)). 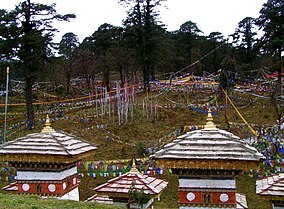 The park is at lamperi 30 kilometres (19 mi) away from Thimpu. Apart from the rhododendrons in the botanical park the other varieties of plants in the park consists of 115 species of ferns. Some of the other important trees are large oak, magnolia and birch. The park is also a popular bird watching area and 46 avifauna species have been identified. Some of the rare species reported are monal pheasants and blood pheasants (Ithaginis cruentus). There are 21 animal species identified in the park which includes musk deer, tiger, leopard, red panda and the leopard cat. ^ a b c d e f "Lamperi, Bhutan Declared Royal Botanical Park". Botanical Park Conservation International. 23 November 2005. Retrieved 17 October 2015. ^ a b "Eco Adventures in the Royal Botanical Park" (pdf). Bhutan Lowcarbon organization. Retrieved 17 October 2015. ^ "Introducing Thimphu to the Dochu La". Lonely Planet. Archived from the original on 17 November 2015. Retrieved 16 October 2015. ^ a b c d "Royal Botanical Park (Information source: Nature and Ecotourism Recreational Division)". Bhutan Trust Fund for environment Conservation. Retrieved 19 October 2015. ^ "First botanical park opens". Bhutan Observer. 24 October 2008. Retrieved 19 October 2015. This page was last edited on 12 November 2018, at 07:23 (UTC).